Every business has unique needs, except for one — the need to get paid. But payment systems can be complicated. We pride ourselves in streamlining everything from transactions and accounting to communication, especially if things go wrong. Our philosophy is simple - set you up with the right tools and access to the right people and make managing your banking relationship hassle-free. More than just merchant services, we support your whole business' financial needs. Best of all, we own the relationship so you are not outsourced for payment processing. Whether you want to launch online payments or seamless shopping cart integrations into your website, we can help you with modern eCommerce tools for your online business. Manage your merchant account quickly and easily with our online, self-service tool, AccessOne. Whatever you need. Mobile plugins, virtual credit card terminals, software interfaces, rotating retail terminals, we’ve got you covered. Safety first. Our free-of-charge solutions are PCI compliant and protect your business and your customers from any theft or breach. No two businesses are alike. And with the unique needs of specific industries, the idea of a one-size fits all solution simply doesn’t hold up. That’s why we tailor solutions unique to your business needs - today and tomorrow. Today’s retailer requires a full suite of credit card payment systems, a catalog of customer insights, and the ability to mobilize your check-out process. Walk into the most successful retail shops and you’ll notice these consistent variables. Our Merchant Services will bring you up to speed with your payment processing, customer analytics, mobile and wireless versatility and a customer-friendly interface that will speed up your sales and encourage upsells. The next generation of payment terminals. 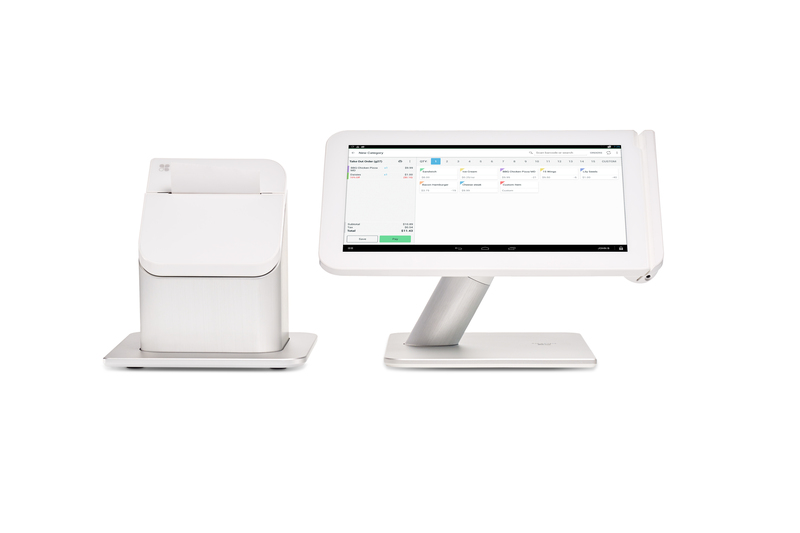 An all-in-one tablet-sized device, perfect if space is tight, offers the power to track inventory and handle many payment types, including chip cards. Plus, it comes with free apps like reporting tools that provide customer insights in simple, easy to understand formats. Sleek, flexible and easy to use. A whole new world of business management. This solution provides cutting-edge technology and enhanced security features, plus a management system that can help you track inventory, manage employees and gain customer insights that will help you build lasting relationships. Perfect for businesses, this system is people friendly and easy to use. Modern Payments, fast and simple. Flex accepts all payment types so your customers can pay how they want to pay. Swipe, chip, type, scan, tap it does it all. The flex is an all-in-one register, terminal and replaces your bulky printer. Funds are automatically transferred to your bank account as fast as the next business day and makes tracking easy with instant connection to your computer and mobile device. Show customers how much you care with a customer loyalty program that will keep them coming back for more. Give customers a way to share their love of your store by letting them buy, send and redeem gift cards on their mobile devices. Use sales analysis to turn your information into valuable insights about your business—like what’s selling best or where your customers live. View your transaction processing information, voids/declines, detailed statements, chargebacks/retrievals, and more with this online, self-service account management tool. Most merchant service solutions for restaurants, hotels and B&Bs use the one-size-fits-all approach. But we know that hospitality is a diverse and often congested industry. Our Merchant Services solutions are catered to your specific needs so that your online booking, credit card terminals and in-house POS systems are all working together effectively while providing you with the data you need to grow your business. Have the sales data you can turn into trends and opportunities, so every time you sear a steak or serve a smoothie, you’ll understand your business better. Draw in more customers with the digital platform that offers them the convenience to buy, send and redeem gift cards on their mobile devices. View your transaction processing information, detailed statements, voids/declines, chargebacks/retrievals, and more with this online, self-service account management tool. Medical and healthcare professionals have needs unlike any other industry. While all must comply with HIPAA requirements, there are other potential complexities to contend with when it comes to processing patient payments. Whether you need to handle payments for a practice that operates in multiple locations or for multiple doctors housed in the same suite; our Merchant Services professionals will help you find the solution to ease the payment experience for you and your patients. The accessibility to construct creative, high-performing websites to sell your products or services from almost anywhere has resulted in a rise in micro-merchant businesses. Whether selling products at markets or accepting payment for services rendered on the spot, the need to process various types of payments is crucial. Our Merchant Services team will work with you to determine what you need now and as your business grows. Accept payments wherever you go. With Clover Go, you can securely and reliably accept both credit and debit cards – including EMV® chip cards – right from your personal smartphone or tablet. Clover Go is Bluetooth enabled and can support up to five devices on one account. Customize tip and tax rates, set permissions for employees, view transaction history and email or text receipts directly to customers. Plus, Clover Go gives you access to clear, intuitive reporting on sales activity, along with powerful insights to help your business grow. Create your own customer loyalty program that makes it more rewarding for customers to keep coming back to your business. Turn your sales data into information you can use, like what sells best when and which neighborhoods in your area are the busiest, so you can plan for more. A unique business like yours can't rely on a cookie-cutter solution. Let the Merchant Services professionals at Hancock Whitney get to know you and your business to suggest solutions that fit your needs. Modern Payments, fast and simple. Flex accepts all payment types so your customers can pay how they want to pay. Swipe, chip, type, scan, tap it does it all. The flex is an all-in-one register, terminal and replaces your bulky printer. Funds are automatically transferred to your bank account as fast as the next business day and make tracking easy with instant connection to your computer and mobile device. A whole new world of business management. This solution provides cutting-edge technology and enhanced security features, plus a management system that can help you track inventory, manage employees and gain customer insights that will help you build lasting relationships. Perfect for small businesses, this system is people friendly and easy to use. Ready to improve your customer’s buying experience? Fill out the form below or give us a call at 888-716-6037 to learn about customized solutions for your business. Hancock Whitney Bank is a contracted reseller of the Clover™ Solution. This Web page or website is not an official page of Clover Network Inc., First Data Corporation, its subsidiaries or affiliated businesses. The Clover trademark and logo are owned by Clover Network, Inc., a First Data company.